“Common sense is not really all that common.” I love this quote, and it harkens back to why I started FamZoo in the first place: there’s so much emphasis on academic learning these days that sometimes we fail to teach our kids the most basic life skills — like personal finance. We seem to assume kids will absorb those skills on their own because, after all, most are just a matter of “common sense,” right? Well, perhaps in retrospect they are, but not to the uninitiated. “Children are sponges — they are going to absorb whatever is around them, so we need to be intentional about what surrounds them.” Great message. When it comes to money, think of what surrounds your kid every day: rampant consumerism. Over 15 billion dollars is spent annually on advertising to kids in the U.S. Yikes! Parents must make an intentional effort to counter that tidal wave of messaging. Unfortunately, parents are also insanely busy. This is where technology like FamZoo can help. Automation can constantly guide and nudge parents to keep their kids on track. “People who have a healthy understanding of wealth don’t obsess about or worship money. They are intentional about how it is handled.” I think this is a very important point. Some parents may be reticent to teach their kids about money for fear that doing so will stoke unhealthy traits like greed or selfishness. Unfortunately, by shielding kids from money, these parents fuel ignorance instead. It’s important to emphasize that the whole point is to teach kids to be thoughtful with money, not obsessive. Kids can’t be thoughtful with money if they never think about it! “You will either intentionally teach your children how to handle money or they will live in your basement until they are forty.” I just thought that was funny, or perhaps as a father of five, terrifying. “Wherever you are, you can teach from today forward and begin a new family tradition with money. You don’t have to be perfect, nor do you have to be paralyzed by the mistakes of the past. You simply have to start.” So true! I hear parents say: “I can’t teach my kids about money because I’ve had trouble with money myself. ” False. When you read Dave’s story, you’ll realize he is living proof to the contrary. The cool thing is: when you start teaching your kids about money, you invariably clean up your own habits too! Double bonus. I also frequently hear: “It’s too late to teach my kids about money.” False. It’s never too late to start teaching your kids good money habits (and it’s rarely too early). FamZoo is all about reducing the activation energy required for parents to get started with teaching their kids about money — and to keep the ball rolling. “If the Ramseys can go from stupidity on steroids, to bankruptcy, to a new family legacy and a new family money tradition, you can too.” I’m a sucker for self deprecation when it’s coupled with determination and optimism, so I loved this closing point to Dave’s intro. 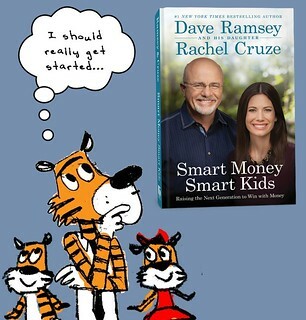 In the introduction, Dave builds a strong case for being intentional and proactive about teaching your kids good money habits. He tackles common objections and instills a can-do attitude. I like what I’m reading so far. Click here to go to the next post in the review series: Setting a Good Money Example for Your Kids: Sufficient? Necessary? 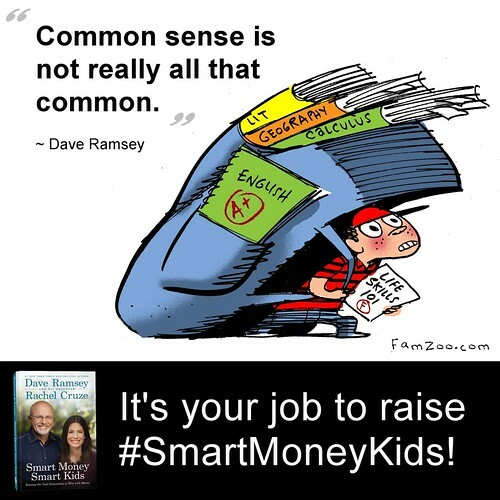 Interested in learning more about the Ramsey recipe for teaching kids good money habits? You don’t even have to wait for the book to come out next month. You can download the first two chapters for free here (be sure to scroll down to the bottom of the page). I am totally in agreement with your first quote about common sense! I was a elementary teacher for several years. It amazed me that kids knew so much about football, wrestlers or princess which parents reinforced yet didn't know basic skills of saying please and thank you. Same is true for money concepts! My husband and I plan to teach this little one that is on the way a lot about money. We will be the generation that changes our family tree! Thank you so much for being about of the link up and sharing about SMSK! I absolutely love your blog! It is a fabulous resource that I am so glad I found!